Join us during the month of April as we celebrate National Poetry Month. Every day during April we are reading one poem together. My preschool daughter pastes the poem into her "My Poetry Book" and then creates a corresponding illustration to accompany the poem of the day. 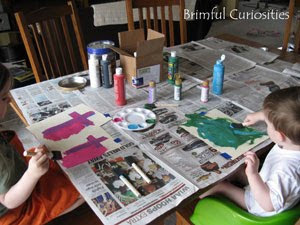 We will share some of the entries throughout the month on Brimful Curiosities. Looking for other kid's related poetry resources? I've compiled a list of Children's Activities and Other Resources for National Poetry Month. The second entry in my daughter's "My Poetry Book" comes from a Concordia Publishing House Arch Book titled The Easter Stranger. Each book in the Arch Book Bible Story paperback series uses rhyming verses to tell a story from the Bible. 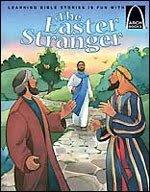 The Easter Stranger covers the passages found in Luke 24:1-35 and shares a story that takes place after Jesus' resurrection. Jesus joins two of his followers on the road to Emmaus and they don't recognize him. Eventually they invite the stranger to stay with them and his identity becomes known as they sit down to eat together. To Tell them of God's mighty plan. So we could live with Him on high. The fight with death our Lord did win! "The Christ will be raised from the dead!" Both kids made a cross and my daughter will place her's in her poetry book to correspond with the Biblical poetry today. To create the cross, I placed removable painter's tape in the shape of a cross on paper and they used paint to cover the page. 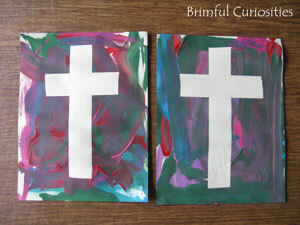 As the painter's tape is removed, the cross is revealed. On Easter we will place a picture of a lily on top of the cross to represent Jesus' resurrection. This week’s Poetry Friday is hosted by the Book Aunt. Head over to her blog for more poetry posts. 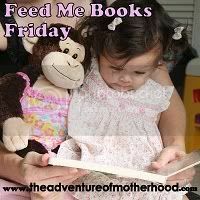 This post is also linked up at Feed Me Books Friday hosted by The Adventure of Motherhood. Ah, I hope to be that organized as a mom one day. I just get giggly goosebumps thinking about doing stuff like this with children. Your girls are so blessed to have you so involved in their lives. I love reading poetry and share a lot of poetry with Selena. Can Can - I do agree that the poetry is sometimes forced in these books, but what I especially like about the series is that the stories very closely follow the actual Biblical text. The many interesting illustrations also add interest to the story and help engage children in the text.